The 135 ft. R/V Point Sur is owned by the University of Southern Mississippi, operated by LUMCON, and based at Gulfport State Port in Gulfport, MS. The R/V Point Sur is equipped to handle operations that include: wet and dry lab use, scientific diving, trawling, large box-core sampling, piston cores, shallow seismic surveys, ROV operations, buoy deployment and recovery, and hydrographic casts with CTD-rosette systems. She has three laboratories and is capable of taking 16 scientists to sea for periods up to three weeks at a time. The main deck runs the length of the vessel and covers approximately 1,100 square feet. A detailed and downloadable description of the R/V Point Sur, including a spec sheet and cruise planning information, is available from our Vessel Operations Office. If you would like to charter the R/V Point Sur, please fill out the pre-cruise questionnaire as soon as possible (before grant proposal submission is best). Please also request ship time by contacting our Vessel Operations Office. After your cruise is complete, please submit a Post-cruise Assessment. If you have any questions about the R/V Point Sur, please contact our Vessel Operations Office or visit our Fees, Policies, and Forms page. Keep up with the R/V Point Sur and her crew by following them on Facebook. 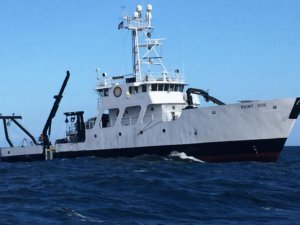 Click here for the University of Southern Mississippi’s page on the R/V Point Sur.